After decades, Washington, DC public station WAMU-FM is sending Bluegrass and other local music programs into that “Lonesome Valley” of HD RadioÒ where there is no one to hear them. Actually, there will be at least a thousand listeners. The station is giving away a thousand HD table radios. The FCC only approved digital HD Radio multicasting on March 22nd, but National Public Radio (NPR) has been hot to trot since May 2001, even before the FCC adopted the iBiquity HD Radio standard. Public stations have used it experimentally since 2004. NPR stations are the white mice of HD Radio. NPR headquarters for HD was even named the NPR Lab. 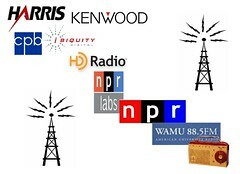 In 2003 NPR, Kenwood USA (subsidiary of Kenwood Corporation of Japan) , and Harris Broadcast Communications, funded by the Corporation for Public Broadcasting (CPB), launched the “Tomorrow Radio” initiative to test and demo this “multicasting” and promote it to the FCC and manufacturers. NPR also did R&D on possible bells and whistles like store and replay features, electronic program guides, traffic and weather reports, and pizza delivery. Okay, I lied about the pizza. In 2005 NPR launched five 24/7 music channels for multicast in AAA (Adult Album Alternative), folk, classical, electronica and jazz formats. NPR became a mini-Clear Channel for stations on the low-number end of the FM dial, providing automated, pre-selected music so stations could add the HD without adding local jobs or content. A year later the NPR-HD Radio cabal demonstrated digital radio for the hearing impaired and vision impaired, stock quotes and emergency alerts at the big National Association of Broadcasters (NAB) convention. That was the last of that. As of this spring, 230 NPR member stations were on air in HD, 60 with second and third channel content. I think that means 170 stations send text-messages to your digital tuner readout: “send money!” or something. To be blunt, NPR is shilling hard for its billion-dollar partners in the HD Radio enterprise. Twenty-three public and commercial stations transmit HD Radio in the DC area, but Clear Channel and CBS stations usually just duplicate their regular programs in HD, and their sound quality is said to suffer from their use of analog compression and EQ for the HD broadcasts. HD Radio has more notable features in store: 5.1 surround sound, and a feature where listeners can only hear the station after they email or phone in and have their chipsets unlocked (sounds painful). It is an interim, transitional technology, because all radio will be moving to digital pretty soon. HD Radio is version one-point-oh of this transitional technology. Tech consumers know what that means. This entry was posted on September 5, 2007 at 7:39 pm and is filed under Bluegrass, HD Radio, media, media consolidation, music, news, NPR, public radio, radio, WAMU-FM, Washington DC. You can follow any responses to this entry through the RSS 2.0 feed. You can leave a response, or trackback from your own site. This is the final step of WAMU’s elitist purge of bluegrass that has been going on for years. Now WAMU can offer the same bland pitiful programs that the other NPR stations on the local dial offer up. This tax money swirling down the NPR toilet would be better spent on Fred Thompson’s campaign: less hypocrisy, more humor. Richard: I find much of Thompson’s humor unintentional. That’s in another post, though. Like what you did. Wishing you a very happy and prosperous new year !